Leicester City manager Nigel Pearson has ruled out the possibility of ex-England striker Emile Heskey returning to the Premier League side as a player. Heskey, 36, who scored 46 goals in 196 games for the Foxes between 1994 and 2000, said he would be interested in signing for the club if approached. Leicester have not scored in five games and are third from bottom. "You are reading a bit too much into it to suggest he would improve what we've got here at the minute," said Pearson. Leonardo Ulloa, Leicester's summer signing from Brighton & Hove Albion, is the Foxes' top-scorer so far this season with five goals, while fellow forwards David Nugent, Chris Wood, Jamie Vardy and Riyad Mahrez have all only netted once. 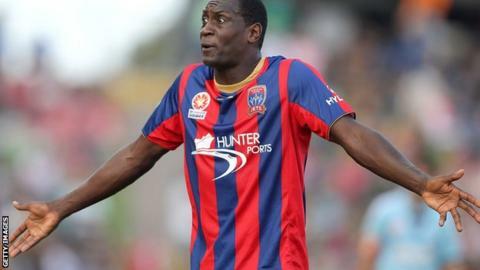 Heskey has already taken up a dual ambassadorial role with Leicester since returning to England following two years with the Newcastle Jets in Australia's A-League. "It's good for the club to have someone of Emile's standing and stature associated with the club," Pearson told BBC Radio Leicester.